India alone, outside Europe, has been able to create and sustain a near-global sporting event. The IPL. India needs to handle the IPL more professionally. hich American sport has been able to graduate into the global league? NBA finals? Major League Baseball (MLB)? NFL’s Super Bowl? These are the three biggest sporting events in the USA – which are domestic US events – with little TV viewership outside the US. The biggest sporting events in the world – Olympics, World Cup Football, Tennis Grand Slam, the F1 auto Grand Prix, are all events that were created by Europeans – and that have gained international buy-in and participation. Not truly global, are top events in badminton, squash, table-tennis, volleyball, cricket that are second-level events with limited participation, viewership and following. Among the BRICS nations, Russia, South Africa, China or Brazil do not ‘politically’ dominate any sport, the way India dominates over cricket. Even before the 1983 Cricket World Cup began, that India won, the future of the cricket world cup was in jeopardy. Without sponsors, the ‘politically’ dominant ECB and Australian Cricket Board, (now Cricket Australia), pronounced the Cricket World Cup dead. The 1983 Indian economy, beginning to feel the benefits of the Bombay High, had also seen the domestic benefit of the 1982 Asian Games. Based on the success of the Asian Games, which saw a dramatic expansion of TV coverage in India, the BCCI made a hesitant pitch at the world cup. BCCI was able to obtain the support of the Pakistan and Sri Lankan cricket Board in this bid. A rather surprised ECB and ACB allowed this bid to go through – probably sure that BCCI would make a mess of it. In the next 4 years, BCCI obtained a sponsor, Reliance, organized the event – and pulled off a successful event. From 1987 onwards, BCCI’s political power has only grown in international cricket. Twenty years after 1987 Cricket World Cup in India, in 2007, India’s major home-grown TV network, ZEE TV launched the Indian Cricket League – independent of BCCI and ICC. Without ICC and BCCI support, the ICL was a lame-duck affair. Two years later, the BCCI launched the IPL in 2008. After the first few years of hesitant growth, in the last one year, the IPL has truly changed world cricket. A few important international players have abandoned their domestic teams – and made IPL their main earning opportunity. The hold of non-Indian cricket boards over their players has weakened considerably – as the IPL earning opportunity is an alternative. Though no player has explicitly stated this, when pushed by domestic boards to choose between national team and their IPL earning opportunity, some chose to go with IPL. With many players from Australia, South Africa, Sri Lanka and West Indies and fewer players from England, New Zealand, Pakistan Bangladesh and Zimbabwe, IPL has attracted international player attention. With 8-9 teams, between 65-80 games, some 250 players, with nearly a quarter of the players international, with support staff that draws the best from the world, the IPL has become a significant sporting opportunity in its sixth year itself. Such growth in stature and with system-wide revenues exceeding Rs.2500 crores (US$500 million), ensures that IPL in the next few years will be in the Top10 global sporting events. This figure of Rs.2500 crores (US$500 million) includes TV rights, advertising, franchise fees, ticket sales, player fees, IPL merchandise. All this without any funds or regulatory support from the Government. Already a world leader in the film industry, for a country like India, to define, create and deliver this kind of sporting event, with its softpower implications, has aroused equal amounts of admiration and envy. While viewership data in non-Indian markets is not yet available, based on player statements, it is significant. It is time that BCCI takes the IPL more seriously – and importantly the mainstream media and the Government too, must handle IPL with some maturity. The amount of police enthusiasm, media noise around the recent alleged spot-fixing, exposed the complete lack of judgement. 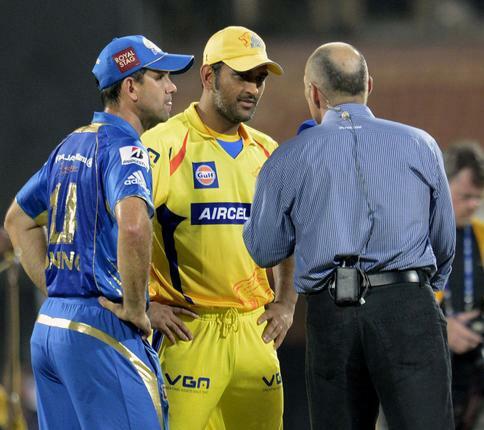 A quiet phone call while the tournament was going on – and hard actions later would have ensured that the IPL success was not compromised as it has been now. The silly moral posturing on a simple sporting entertainment shows mental vacuity – especially in the mainstream and the social media. The chatteratti, twitteratti, FaceBookeratti, the Libtards and the Righturds have great enthusiasm in out-doing each other in empty moral indignation. This moral noise, by those with negligible achievements of their own, over alleged questionable behavior exposes their mental vacuity. These questionable actions by probably 10 people is not representative or reflective of the effort and achievements of the 1000 people who are behind the IPL event (mainly players, coaches, support staff, franchise managers, media staff, stadium staff, BCCI administrators). All that is needed is that these 10 people are adequately and significantly dealt with – post-facto. After the event. This unholy haste, while the tournament is in progress smacks of envy and immaturity. Thankfully, Bharat understands this – and will turn out in gargantuan numbers today evening, and crown the winners of a magnificent event. If India does not start behaving with maturity, be warned. Bharat will simply cast you aside – and consign you to the dustbin of history. Time India took itself seriously. China is currently in border disputes with Vietnam, Japan, Philippines, Cambodia, – apart from India. Is that why they are nervous? 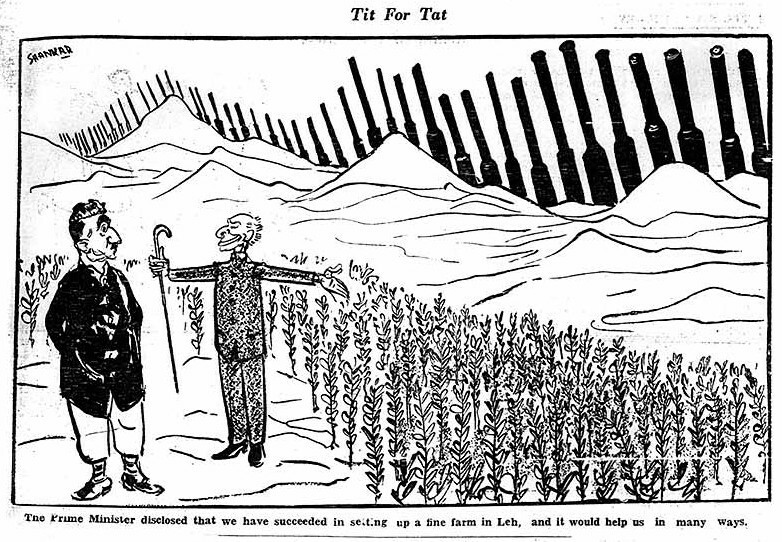 Shankar’s cartoon on Decmber 17, 1961 in his own cartoon magazine, Shanker’s Weekly, forewarned PM Nehru about the imminent Chinese threat – nearly one year in advance. hat could have provoked China to send 50 soldiers over to the Indian border? I mean, fifty soldiers …? Obviously, they were not expecting fifty soldiers to take and keep Indian territory. Reasonably, they are also not trying to open a second front against India, while they were making tough moves against Japan. Understandably, this was also, like Kargil, not some adventurism by rogue elements in the PLA. Three things come to mind. One – China seeks to ‘talk’ from a position of strength. These perceptions are important to the Chinese. Especially, when the first foreign visit by the Chinese Prime Minister, Li Keqiang is to India – onward to Pakistan, Germany and Switzerland. 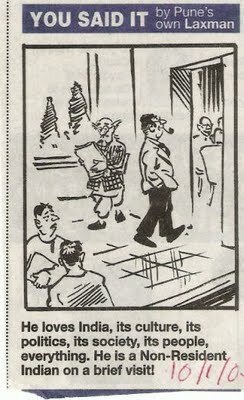 If this is true, don’t the Chinese understand that Nehru took on the Western world, without military or economic might. Indira Gandhi took on the US, plus Pakistan with the risk of a China joining in, on the side of Pakistan, in the 1971 War. So these fifty soldiers and five tents will only reduce goodwill – and not induce any fear, respect or regard for the Chinese in India. Two – Was it Chinese nervousness? While the Chinese were busy with the Japanese, did Indians take ‘advantage’ to strengthen their positions in the Himalayan heights? Was this a warning to India, not to take advantage of Chinese ‘preoccupation’? India says Chinese soldiers have set up camp 19km (12 miles) on its side of the “line of actual control” (LAC) that separates Ladakh in its state of Jammu & Kashmir from China, in the absence of an agreed border. Japan reports that Chinese maritime surveillance vessels are every day circling the disputed Senkaku or Diaoyu islands in the East China Sea. And on April 26th China demanded that the Philippines “withdraw all its nationals and facilities” from a number of islands and reefs in the South China Sea, where they have been, in some cases, for decades. In all these cases China can with some justification claim it is responding to provocation. Ajai Shukla, an Indian defence analyst, has pointed out that the Indian army has been undertaking what he calls its “third surge towards the Sino-Indian border”. The previous two were in the late 1950s—leading to the 1962 war—and in 1986, leading to the present stalemate. Now, once again, says Mr Shukla, India has been “thickening” its presence in Arunachal Pradesh and in Aksai Chin, with more soldiers, weaponry and infrastructure. So China may feel India is exploiting both the inexperience of its new leaders who took over last November, and the pressure China is under on other fronts. It may harbour similar suspicions about Japan and its “provocations” over what China calls the Diaoyu islands. Its patrols near the islands were prompted by Japan’s ignoring its warnings not to “nationalise” three of the islands by buying them from their private owner last September. The demand directed at the Philippines, that it withdraw from disputed islands, was also a reaction—to the Philippines’ taking its dispute with China to the International Tribunal on the Law of the Sea. China rightly points out that, although the law of the sea sets rules about the waters and exclusive economic zones around islands, it says nothing about sovereignty over them. 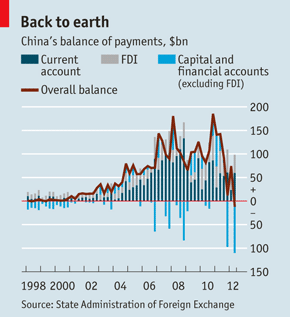 via Banyan: Thunder out of China | The Economist. Three – India can cut-off China’s vital shipping and logistics lines through the Karakoram and the Straits of Malacca in Indian Ocean. Was China covering their nervousness with these aggressive gestures? 1. China is under sanctions or limits from the three major armament vendor blocs US, EU and Russia. While US and EU have sanctioned China, ostensibly, over Tienanmen Square. But, of course, the real reason is US and EU don’t want to arm a rival for Western military influence in Asia. Apart from some border issues between Russia and China, Russia, finally, has more commercial reasons. China has simply copied Russian defense designs and tried selling these products to third-party countries at heavily discounted prices. Russians have been hit by reduced purchases committed by China, lower prices in face of Chinese competition and outright losses to Chinese orders. China still does not have crucial sub-assembly technologies – like jet engines, AESA radars, electronic warfare systems, and has also been shut out of the market. India on the other hand, can practically buy whatever is available. 2: – India is threatened from two sides – Pakistan and China. Pakistan today does not have aircraft to fly or missiles to fire. Under similar sanctions like China, Pakistan’s preparedness is close to nil. In Kargil, they could send no more than 2000 soldiers. China is currently in border disputes with Vietnam, Japan, Philippines, Cambodia, – apart from India. China’s behaviour has so caused affront in Vietnam, that Vietnam made friendly overtures to ex-enemy America against their ex-ally, China. 3: – Recent war record. In the last war against Vietnam, China came out with a bloody nose. In the last two wars against Pakistan, India came out victor. On the more recent Kargil War, here are some interesting thoughts. 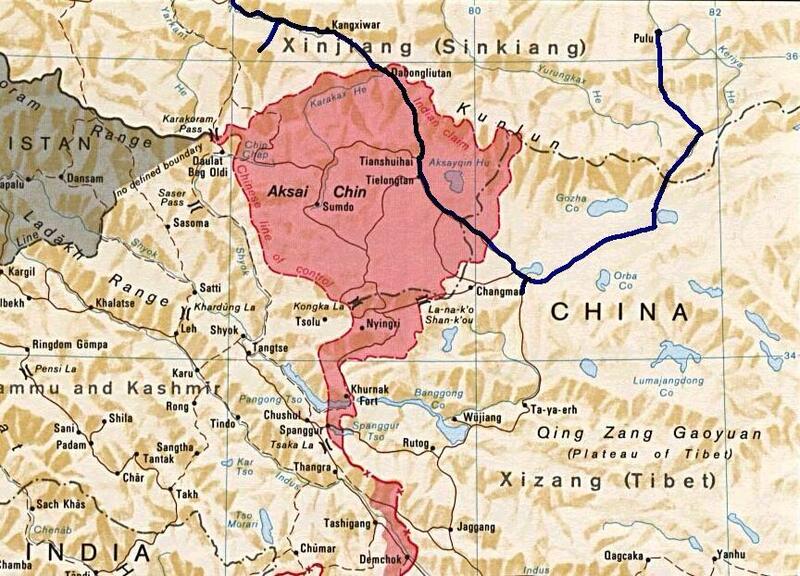 September 26, 2012: China has, in the last few years, demanded that India turn over a contested area in northeast India (Arunachal Pradesh, which China claims as a part of Tibet). China then escalated its demands by refusing to allow Indians born in the disputed area to visit China. This Chinese behavior has angered India, which two years ago implemented a five year plan to increase their ability to deal with any Chinese aggression against Arunachal Pradesh, by increasing its defense spending. But since both nations have nuclear weapons, a major war over Arunachal Pradesh is unlikely, but not impossible. India fears that China might try to carry out a lightning campaign (a few days, or a week), and then offer peace terms (with China keeping all or part of Arunachal Pradesh). Since neither country would be willing to start a full scale nuclear war over Arunachal Pradesh (a rural area with a population of about a million people, spread among 84,000 square kilometers of mountains and valleys), the “grab and parley” strategy has to be taken seriously. In the meantime, China keeps finding ways to annoy India over this issue. Meanwhile, India seems quite confident that they can handle China if a war breaks out in this mountainous wilderness. Partly that’s because India is playing defense here, which always confers an advantage. But India’s big advantage is that it has recent (1999) combat experience in mountain warfare. China has not fought since 1979, and what was in the hill country on the Vietnamese border. Not only was India’s combat experience recent but it was in the same mountain range (the Himalayas) where they face China. That 1999 war got little publicity, so it’s generally unknown outside India how much that experience changed the Indian armed forces. That’s not surprising. The foe in that war, Pakistan, did not even officially admit to its role in that undeclared war until 2010. Two years ago the names of 453 soldiers killed in “the Kargil war” were posted on the Pakistani Army website. Although the Pakistani troops, masquerading as Islamic terrorists, were forced to retreat during the 1999 conflict, Pakistan still considered it a victory (because it garnered much publicity for their terrorism campaign in Kashmir and India chose not to mount a major invasion of Pakistan). India lost about 550 troops in the fighting. The elected Pakistani government of the time was opposed to the Kargil operation and tried to remove the head of the armed forces (general Pervez Musharraf). In response, Musharraf staged a coup and ruled the country for the next nine years. Although the Indians succeeded in forcing the Pakistanis to retreat, the unexpected conflict exposed deficiencies in the equipment, training, and tactics of the Army and Air Force, as well as the ability of the two services to coordinate their operations. The Indian military was not keen on giving a lot of publicity to the problems they had during the 74 day Kargil campaign. But in the last decade it’s been noted that Indian military reformers often invoke Kargil, and that tends to help overwhelm opposition to needed changes. This has led to more attention being paid to what went on during the high altitude (4,000 meters and up) conflict. As a result of Kargil the army has purchased a lot of new high-tech gear for its infantry, revised training methods, and even changed the organization of infantry battalions. The air force has bought more heavy transports (American C-17s) and set up closer and continuous coordination with the army and navy. The air force has studied the unique conditions encountered over these high mountains and trained their pilots to deal with it. The Chinese are just now catching up with this item. Initially, the impetus behind all these reforms was to avoid another “messy victory” as had been achieved in 1999. But nine years later China started making territorial demands about similar high mountain terrain to the east of Kargil. While initially scary, as the Indians reviewed their readiness for such a conflict they realized they were still in the midst of reforms intended to improve their mountain warfare capabilities. Now it was China’s turn to wonder if they were ready for war in the Himalayas. via Leadership: The Indian Edge Over China. Pakistanis want to pass of as Indians; Brown Americans want to save India and the British want to be born as Indians. What’s on with India, these days? But, on a more serious note – and a more recent case, a Pakistani health worker in the US, in an intensive care unit, caught in the Boston Marathon bombings, recounted his thoughts and reactions. As a 20-something Pakistani male with dark stubble (an ode more to my hectic schedule as a resident in the intensive-care unit than to any aesthetic or ideology), would I not fit the bill? I know I look like Hollywood’s favorite post-cold-war movie villain. I’ve had plenty of experience getting intimately frisked at airports. Was it advisable to go back to pick up my friend’s camera that he had forgotten in his child’s stroller in the mall? I remember feeling grateful that I wasn’t wearing a backpack, which I imagined might look suspicious. My mind wandered to when I would be working in the intensive care unit the next day, possibly taking care of victims of the blast. What would I tell them when they asked where I was from (a question I am often posed)? Wouldn’t it be easier to just tell people I was from India or Bangladesh? via Living Through Terror, in Rawalpindi and Boston – NYTimes.com. Can Western Islamophobia be calmed if you are from India? Something, somewhere, someone must have done the right things, to be in this situation. Not many remember how in the late 70s, British immigration authorities subjected Indian women to virginity tests – to prove what, I could never understand. If you thought that only Tories, Right-Whingers and Conservations were racists, the Prime Minister of UK at that time was a Labour leader, Jim Callaghan. But London is a strange place. As Vir Sanghvi found out a few years ago, dealing with rather rude and surly staff at Heathrow – seemingly, only to Indians. Turns out that Vir Sanghvi was talking of rude and surly British-Indians manning the counters at London Heathrow. More recently, a Brown American blogger, was found in the blogosphere, nonchalantly referring to Indians as dogs. In writing, openly and publicly. When challenged, obstinately, he chose to defend his uncivil attitude. Just shows that culture is nothing to do with genes. It is all about satsang. But rather indicative was a recent poll by a British advertising agency. One of those vague polls that PEW Centre specializes in. Do Hindus Hate Muslims more than Muslims Hate Hindus type of polls. Where people at PEW judge a nation by asking 2000 people out of 20 crore (200 million), very broad questions – and seem to get rather precise answers. But all said, these polls can be indicative. Sometimes at least. OK. Rarely, if you must insist. After a year-long study, a British media agency, OMD revealed that 32% of Britons in the 16-24 age group think that India is probably the country they would prefer to be born in as India afforded more opportunities. Younger Britons who think that India would be best, is higher at 36%. via Brits would rather have been born Indian – Hindustan Times. A man should know his limits. Now Britishers are a tough act. After 200 years in India, it made no difference. They are still in the same game. Of war, killing, loot, fraud, murder, etc. See how Daulat Beg Oldie can be used to cut off China from Pakistan and Gwadar. ight at the onset, the Chinese military contingent pitching tents at Daulat Beg Oldie in Ladakh was a gesture. It was, of course, very clear that India of 2013 was not the India of 1962, when facing China. The small Chinese contingent was making a symbolic gesture – and India was responding to that gesture. The reasons are clear. Though not to everyone. China has significant numerical superiority – but technically and qualitatively, India can hold off and beat any kind of Chinese adventurism. India’s qualitative superiority was also probably true even in 1962. Keeping in mind that the Indian soldiers of ’62 had been all over the world during WWII. Unlike China. Except the peculiar situations of the 1962 hides this aspect. What 99.9% of the commentariat on the 1962 War with China forget is that the Chinese used the cover of the Cuban Missile Crisis. The Cuban Missile Crisis was when the world came closest to a nuclear war – according to some. While the world’s attention was locked onto Khruschev-Kennedy confrontation over Soviet nuclear missiles stationed in Cuba, China played mischief. From 1959, to 1962, border skirmishes with China and ‘friendly’ talks were the norm. Three contentious years later, Chinese forces launched a surprise invasion on October 20; the same day the Kennedy administration decided to enact a blockade of Cuba to keep Soviet missiles out of the Western Hemisphere. via A Forgotten War In The Himalayas. To this offer of help, Nehru wrote two letters to Kennedy. Detailing what help US could extend. W. Averell Harriman, Assistant Secretary of State for Far Eastern Affairs, and Duncan Sandys, British Secretary of State for Commonwealth Relations, led a small group of diplomatic and military experts to India on November 22. While the experts assessed India’s military needs, Harriman, Sandys, and Galbraith discussed the implications of the border war with Nehru. Harriman and Sandys made clear their governments’ willingness to provide military assistance to India but pointed out the related need for negotiations to resolve the Kashmir dispute. In a private meeting with Nehru, Harriman stated that unless tensions over Kashmir eased, the United States could not continue to provide military assistance to both parties to the conflict. Nehru reluctantly agreed to negotiations but warned that in the wake of the humiliation suffered by India at the hands of China, Indian public opinion would not stand for significant concessions to Pakistan over Kashmir. (via FRUS, Vol. XIX, 1961-1963, South Asia. Indian proposals to the US for help in armaments were met with talks, delays, and inaction. A drip of US military aid started, well after the war was over and continued till 1965 war with Pakistan. Under the cover of the Cuban Missile crisis, the Chinese gave India a resounding slap in the middle of still-friendly talks. SECOND -Before Indians could retaliate, the Chinese had withdrawn and were talking peace. The world, in an extremely stressful situation, pressured India to accept Chinese peace overtures. After slapping us Chinese ‘talked’ peace profusely – before we could slap them back. And in the middle of the Cuban crisis, the world was afraid that this border conflict could draw in opposing allies and deteriorate into a wider conflict. THREE – According to modern Chinese analysts, like Wang Jisi, in 1962, Mao was struggling to retain his hold on the party. He alone took this decision to send those soldiers to give a quick slap and run back to the Chinese side of the border. 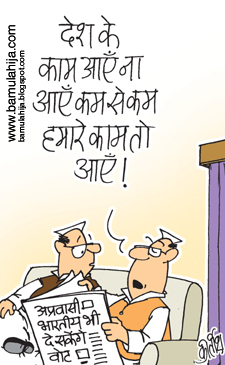 lost control of number of practical issues. So he wanted to testify and show he was still in power, especially of the military. So he called the commander in Tibet and asked Zhang are you confident you can win the war with India?” Wang said. The name Zhang referred to Zhang Guohua, the then PLA commander of the Tibet Regiment. “The Commander said, ‘Yes Mao, we can easily win the war’. Mao said ‘go ahead and do that’. The purpose was to show that he was personally in control of the military. So it had little to do with territorial dispute, (may be) something to do with Tibet but not necessarily,” according to Wang, who was also associated with the Institute of International Strategic Studies of Party School of the CPC. The strategist believes that most of the wars fought under the CPC leadership had strong links with domestic crises. “Everything China did in the border war with Soviet Union was triggered by domestic crisis in 1969″ and so was 1979 war with Vietnam which was launched partly because Mao’s successor Deng Xiaoping wanted to emerge as top leader, he said. Asked whether he was convinced that domestic issues, more than territorial ambitions, prompted Mao to launch the war against India, Wang said “Yes yes I buy that theory because I looked at other episodes of history. Asserting that China did not gain much out of the war, Wang said he was told by a top Chinese diplomat who served in India that the “war was totally unnecessary”. via Mao ordered 1962 war to regain CPC control: Chinese strategist. Today’s India’s airforce with Su-30MKI air dominance aircraft, Brahmos missiles, aircraft carriers have no Chinese equivalents. On Russia for vital engines for its aircraft. On it unreliable domestic armaments industry. It is also on an international blacklist for arms supply. India, too is dependent on imports. But, look at India’s track record. At the height of the Kargil war, India was able to muster the French and Israelis to make emergency modifications to Mirage aircraft. These modifications helped IAF to fire laser-guided bombs that smoked out the Pakistani soldiers from camouflaged caves in the Himalayas. China has no such options.China’s track record in war scenarios has been patchy. In Korean and Vietnam Wars the Chinese support and intervention had no effect. China’s invasion of Vietnam in 1979 was a failure. Its’ attack on India in 1962 was under the cover of international crisis. China’s was badly brutalized at the hands of the Soviets in the 1969 War with Soviets. Keeping this in mind, China will be mindful of an open attack. India on the other hand has a successful record against the US-Pakistan War against India in 1965. Similarly, staring down the US 7th Fleet while attacking Pakistan on two front, or turning tables in Kargil. In the all the three wars of 1965, 1971 and the Kargil War, China was kept out of the war, with only lip sympathy to Pakistan. But while all this was happening what do some Brown American do? Here is what Sadanand Dhume was doing. Other Brown Americans do it differently. Another will ‘shield’ Hinduism, while attacking India’s economic achievements and future (auto, software industries, for instance.). Another will scorn Indian education challenges with a dubious US public school model. These Brown Americans are no less than the more famous stone-pelters from Lal-Chowk in Srinagar. All that they want to do, is throw stones at something Indian. NEW DELHI: The 20-day military standoff with China at an altitude of 16,300-feet in Ladakh has ended. After furious activity over diplomatic channels, coupled with two flag meetings on Saturday and Sunday afternoon, the Chinese troops retreated from the Depsang Bulge area to their bases on Sunday evening. The resolution of the troop face-off came even as preparations were in full swing for foreign minister Salman Khurshid’s visit to Beijing on May 9 despite a growing political clamour to cancel the trip. Now, the visit will go ahead as scheduled, in preparation for the May 20 visit to India by Chinese premier Li Keqiang. There was no immediate word on the conditions decided for the mutual withdrawal of the troops, confronting each other on the heights since April 15. The earlier refusal by the Chinese to withdraw its soldiers from northern Ladakh, where they had pitched tents 19 km inside Indian territory, has created a national security scare in India. via China-India face-off ends as armies withdraw from Ladakh – The Times of India. Only 612 Indian names, mostly businessmen, in the 1.2 lakh names. This vindicates 2ndlook reading on corruption in India. or at least 5 years, it has been 2ndlook position that corruption in India is a small problem. All those stories about trillions in Swiss accounts, turned out to be just hot air. Based on 2ndlook at some economic and business realities it was clear that these corruption-in-India claims were just plain flibbertigibbet. Arvind Kejriwal, Anna-bhau take that. Eat crow now. Indians businessmen are a small part of this offshore mechanism. This data is broadly in line with the trend. For India, which is a Top-5 economy, to have so few people in the list proves two things. One: Indian take on corruption is round-tripped back into India. Two: Indians generally lack faith in these corporate structures – and would rather hand over money to their CAs, who will handle this for free. Typically, specialist Indian CAs handle this money on a simple understanding. Only the principal will be returned – and actual investments at the instruction of the beneficiary, if any, will come back to the beneficiary. Otherwise all risks and benefits from the deployment of these funds will be the CAs take. Three: Indians understand money much better – and can handle it themselves instead of saand-ka-tel (snake-oil) MNC salesmen. In the next few days we will read and hear more. But on thing is clear. Indian Express will not be able to suppress it – as the same data can be released by other media houses in the rest of the world. I presume in the next 2-3 months, this data will be publicly available – and data-scraping software will be used by others. Here is the initial story. In the biggest global expose of its kind on offshore investments and secret financial transactions, an international group of investigative journalists has found details of more than 1.2 lakh offshore entities and trusts belonging to individuals and companies in more than 170 countries and territories, including India. These individuals and companies include politicians, the mega rich and tax offenders, among others, who have invested in tax havens such as the British Virgin Islands, the Cook Islands, Samoa and other offshore hideaways. 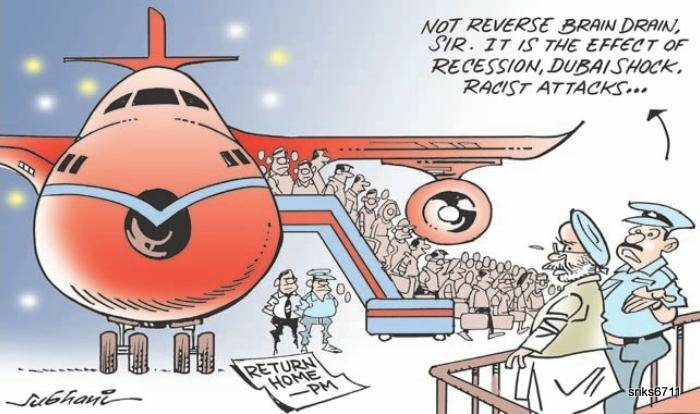 The 612 Indians in this list include two members of Parliament — Lok Sabha Congress MP Vivekanand Gaddam and RS member Vijay Mallya — and several industrialists such as Ravikant Ruia, Samir Modi, Chetan Burman, Abhey Kumar Oswal, Rahul Mammen Mappillai, Teja Raju, Saurabh Mittal and Vinod Doshi. Details of these transactions were contained in 2.5 million secret files and accounted for more than 260 gigabytes of data. They were obtained by the International Consortium of Investigative Journalists (ICIJ) and their total size is more than 160 times larger than the leak of the US State Department documents by Wikileaks in 2010. Based in Washington DC, ICIJ (www.icij.org) is an independent network of reporters who work together on cross-border investigations. ICIJ collaborated with 38 media organisations around the world, including the The Indian Express, for this ambitious global project and to analyse the documents. The other media partners include The Washington Post in the US, The Guardian and BBC in Britain, Le Monde in France and the Canadian Broadcasting Corporation. The 15-month long investigation has found that alongside perfectly legal transactions, the secrecy and lax oversight offered by the offshore world allows fraud, tax dodging and political corruption to thrive. The expose has also thrown light on the functioning of “nominee directors” in offshore companies, several of whom have also been engaged by Indian patrons of offshore companies. For instance, a cluster of 28 “sham directors” have been identified as having served as the on-paper representatives of more than 21,000 companies between them, with some individual directors representing as many as 4,000 companies each. The expose comes shortly after a list of 18 Indians who had bank accounts in the LGT Liechtenstein Bank and around 700 Indians who had accounts in HSBC in Geneva became public. In both cases, account holders were prosecuted and paid penalties to Income-Tax authorities for deposits they had made abroad without paying taxes in India. via Global media investigation finds 612 Indian firms in tax havens – Indian Express.